I took the opportunity of a trip to London to slip into the Hayward Gallery to have a look at the Andreas Gursky retrospective. 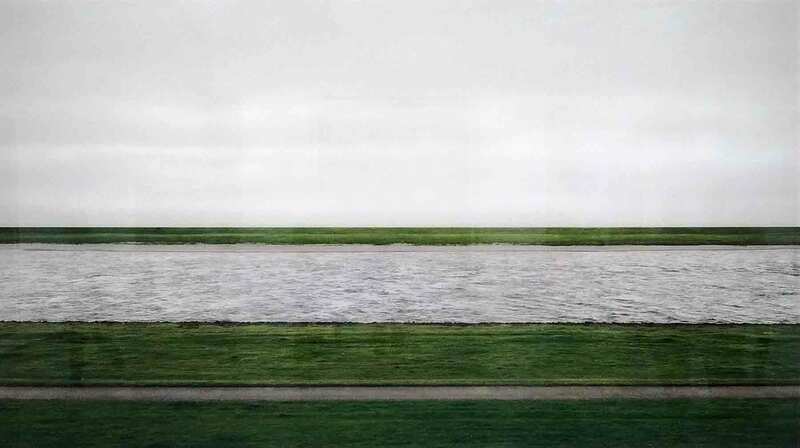 I’ve been interested in Gursky for some time as, like fellow German Anselm Kiefer, he is someone who uses his art to ask big questions (see “The fine art of asking big questions” and “Anselm Kiefer and the art of algae”). Gursky is principally a photographer rather than painter or sculptor though, like Kiefer, he works at large scales. The Rhine II, the picture at the top of this post, is 3.5 m long and 2 metres high, for example. Taking a picture on a mobile phone doesn’t really do it justice, particularly as Gursky’s works, though they look naturalistic, are the result of extensive digital manipulation. In this case, he has turned a landscape of the River Rhine near Dusseldorf into a near-abstract composition. This involved digital manipulation to remove all evidence of buildings on the far side of the river. The next picture I’ve included is the type of image for which Gursky is best-known: monumental images taken from a high viewpoint and teeming with activities associated with global capitalism. In this case, he has photographed a factory in Vietnam that is making cane furniture for IKEA. 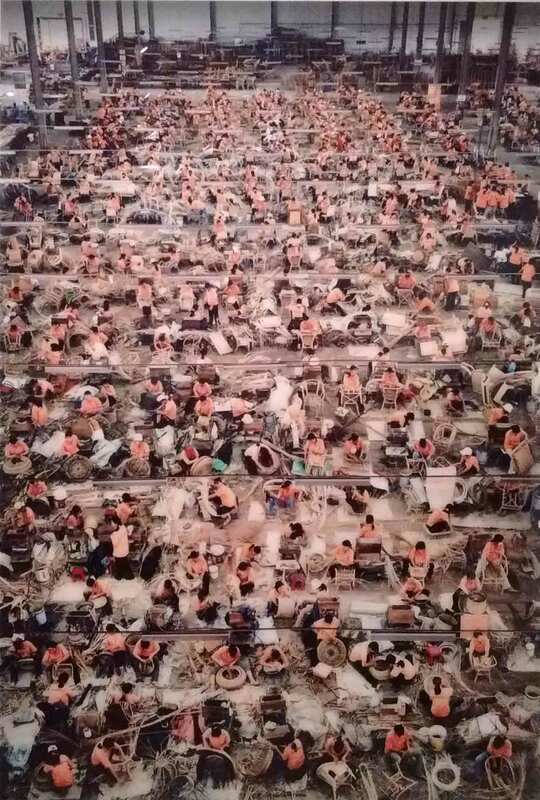 I look at this work as a descendent of Bruegel’s busy pictures from the sixteenth century except that Gursky’s narrative is very different to anything that Bruegel tried to portray. Here, the sea of identically-attired individuals all performing variations of the same basic processes merge into a repetitive abstract pattern. It is the antithesis of Cartier-Bresson’s “decisive moment” not just because there is no single “moment” that is being captured but also because the impression of spontaneity is also false: these large images are, in fact, composed from many different images. It is not always apparent on first viewing but close examination reveals the images to be uniformly in focus from front to back and, in the case of the panoramic views, to have no issues with distortion at the edges. So Gursky also takes us to that ambiguous territory where images look like they are depicting an actual point in space and time but they are not yet, at the same time, they are conveying truths about the modern world. We approach his work with an expectation that photographs represent reality. But they don’t. Or do they? Les Mées is another example of a superficially simple image of an enormous solar farm in southern France, with the Alps as a backdrop. Once again, however, there is post-production manipulation of the image but also, in part a consequence of scale, the invitation for the viewer to contemplate and meditate on what is portrayed. 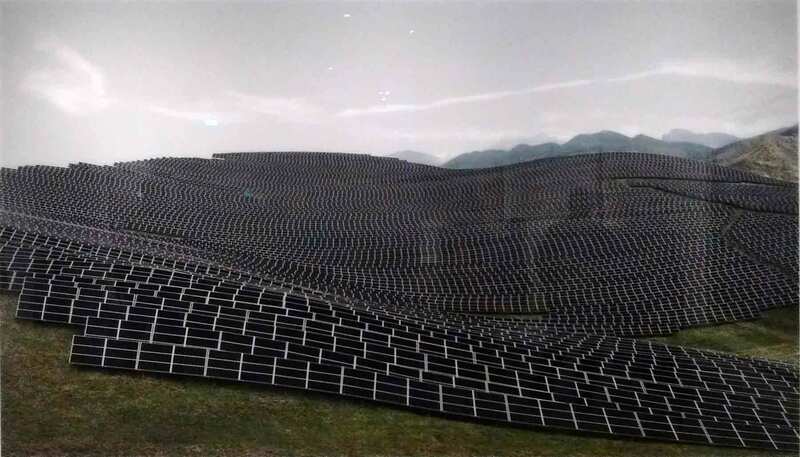 Here we have the juxtaposition between the regular, angular solar panels completely covering the hillsides in the foreground, and the natural beauty of the Alps behind. The manmade looks that much more artificial through the juxtaposition with the grandeur of the mountains. One of the ironies of the image is that solar panels represent a sustainable future yet are, in this location, as much of a visual pollutant as an oil refinery. This solar farm covers 200 hectares and generates enough electricity to power 12,000 households. How many more of these would be needed to break the West’s dependence on oil and how many more landscapes would be changed as a result? Energy always has comes at a price. Gursky’s talent is to simultaneously draw viewers in to inspect the details whilst forcing them to step back and absorb the whole. As you realise from the details that the image may not be exactly what first impressions suggest, so your mind is opened to other readings. We look at these images both as technical creations in their own right but also as commentaries on the state of the world. Gursky manages to simultaneously challenge our eyes and our thinking. Andreas Gursky (2016) Les Mées. 221 x 367 cm. Coda: A week after visiting the Gursky retrospective, I saw The Square at the Tyneside cinema. If you have not heard of this film, it is a film about a contemporary art gallery directed by Ruben Őstland. The plot focuses on the curator of a contemporary art gallery who is trying to present high-minded conceptual art with a moral message relevant to our times so it was hard not to escape the parallels with the Gursky retrospective. Much of the dark humour in the film arises from the curator’s inability to reconcile these high ideals with his own private life (one of the key sequences involves a one night stand with a journalist – played by Elisabeth Moss – whose name he subsequently cannot remember). One gets a sense when seeing art in the hushed sepulchres that are contemporary art galleries that these have a quasi-spiritual role in a largely secular age. I have no problem with this, especially if the art makes people think about their place in the modern world. But that does place a great responsibility on the artists and curators, in turn creating the potential for storylines such as that in The Square. Ruben Őstland has done for contemporary art what Graham Greene was so good at doing for the Roman Catholic church: highlighting the paradoxes that are inevitable when fallible humans struggle to address the biggest questions of all. 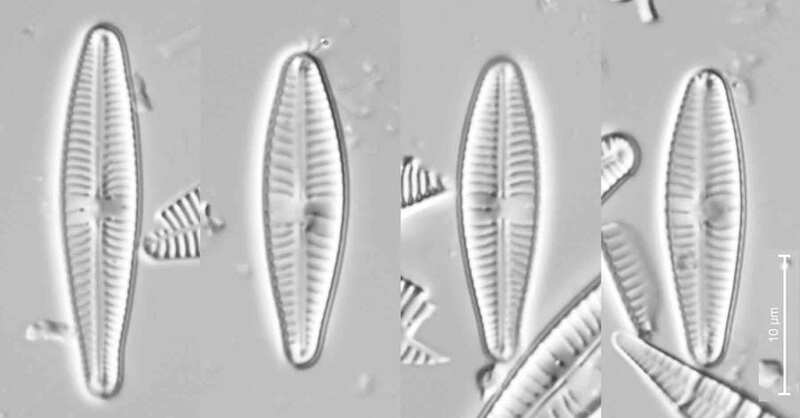 Few of the participants in the UK / Ireland diatom ring-test that I described in my previous post felt any need to thank me for my choice of slide for our 50th test. The slide came from a spring in County Mayo, Ireland, which is part of the Agricultural Catchments Programme, a large study into the effect of farming on water quality. 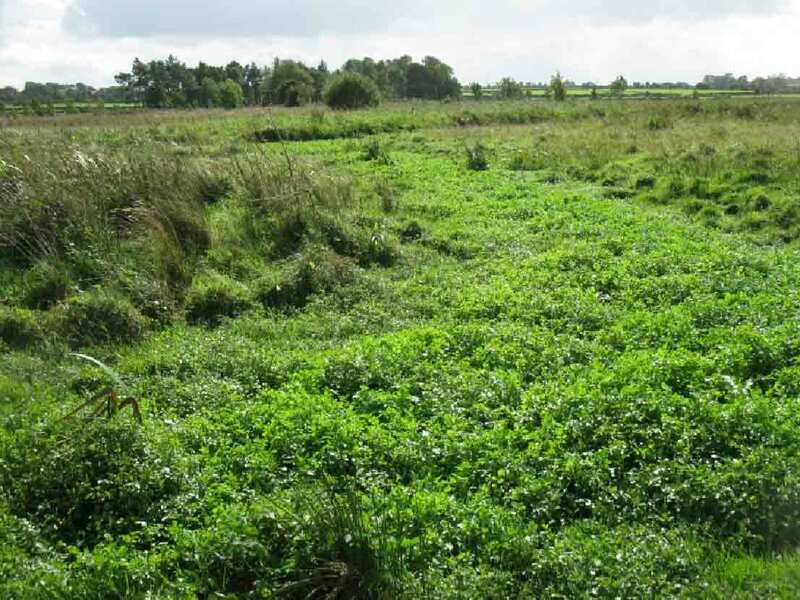 The sample itself came from the stems and leaves of the submerged water cress (Nasturtium officinale*) plants which fill the entire channel. It was a real stinker, with a mess of Gomphonema forms, several of which did not neatly fit any species description that we could find. A conservative reckoning is that there were at least eight different Gomphonema “species” and that raises a further question about what it was about this habitat that led to so much diversity within a single genus within a single sample. First, a quick tour around some of the Gomphonema forms that we found. There was general agreement that the most common type was close to G. micropus Kützing 1844 but not a perfect match to published descriptions (the stria density, in particular, was too low). The situation was further complicated because the status of G. micropus was questioned at times, with it being treated as a variety of G. parvulum and placed in the G. angustatum complex by different authorities during the 20th century. Then there were a number of valves with more rounded ends and a higher striae density than G. micropus but which, if you look closely, are not symmetrical around the long axis. We thought that these were close to G. cymbelliclinum Reichardt & Lange-Bertalot 1999. Unfortunately, there were also quite a lot of valves that had intermediate properties, making it hard, in many cases, to say whether it was one species or the other. Gomphonema cf cymbelliclinum from Cregduff spring, Co. Mayo, Ireland, September 2017. Photographs: Bryan Kennedy. Scale bar: 10 micrometres ( = 100th of a millimetre). We also found some valves that were close to descriptions of Gomphonema utae Lange-Bertalot & Reichardt 1999 and some that were close to G. parallelistriatum Lange-Bertalot & Reichardt 1991. We also found representatives of the G. parvulum complex, G. tergestinum and G. subclavatum (more about this one in the next post). Gomphonema cf utae from Cregduff spring, Co. Mayo, Ireland, September 2017. Photographs: Bryan Kennedy. Scale bar: 10 micrometres ( = 100th of a millimetre). Gomphonema cf parallelistriatum from Cregduff spring, Co. Mayo, Ireland, September 2017. Photographs: Bryan Kennedy. Scale bar: 10 micrometres ( = 100th of a millimetre). So what is going on here? There are, I suspect, two key elements to the story that we need to explain. The first is the limits of species within Gomphonema. 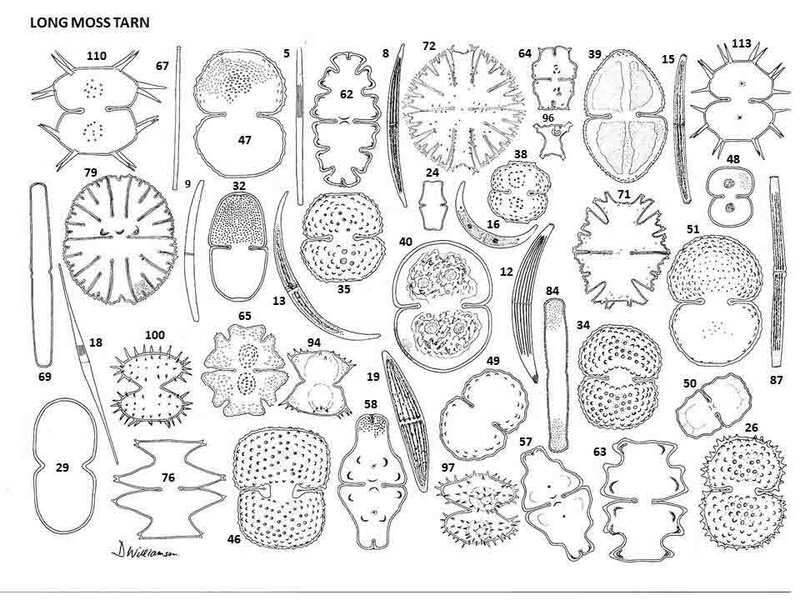 I’ve touched on this before (see “Diatoms and dinosaurs”) and some recent studies that combine morphological and molecular biological evidence also cast doubt on our ability to differentiate within this genus using classical approaches. Whilst I was struggling to disentangle the species in this sample, I had a conversation with an eminent taxonomist and she hinted darkly that Gomphonema was “over-described”. There is a readiness to “split” established taxa and describe new species that, in her opinion, runs ahead of the evidence. The limitations of taxonomy cannot explain all of the variation that we observed in this sample, so the second question to ask is what it is about the conditions here that allow so many representatives of one genus to thrive. I’ve touched on this subject before (see “Baffled by the benthos (1)” and “Baffled by the benthos(2)”). 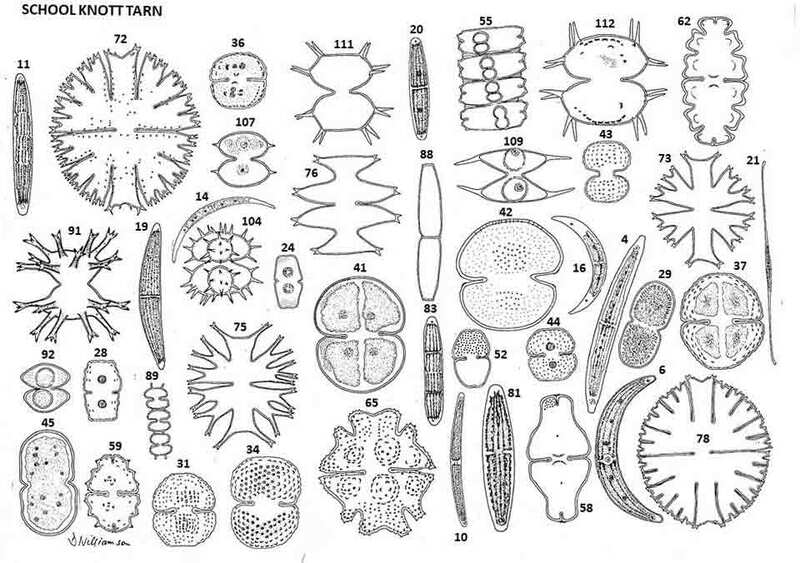 In these posts I introduced G. Evelyn Hutchinson’s “paradox of the plankton” in which he suggested that environments that look uniform, to mortals six orders of magnitude larger than algae are, in fact, considerably more heterogeneous and, so offer more opportunities for “variations on a theme” to thrive. 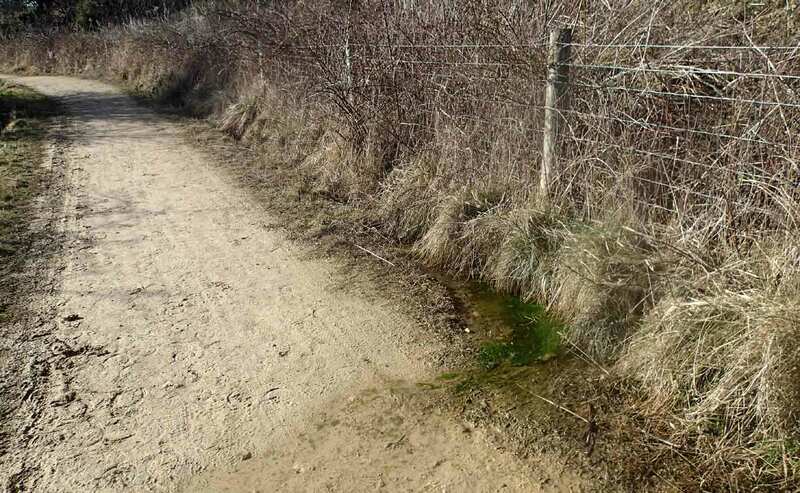 In the second post I went on to suggest that this type of diversity imparts resilience to an ecosystem and so should be looked upon as a positive feature of the ecosystem when doing ecological status assessments. There is, however, one final possibility that, to my knowledge, has not yet been explored. 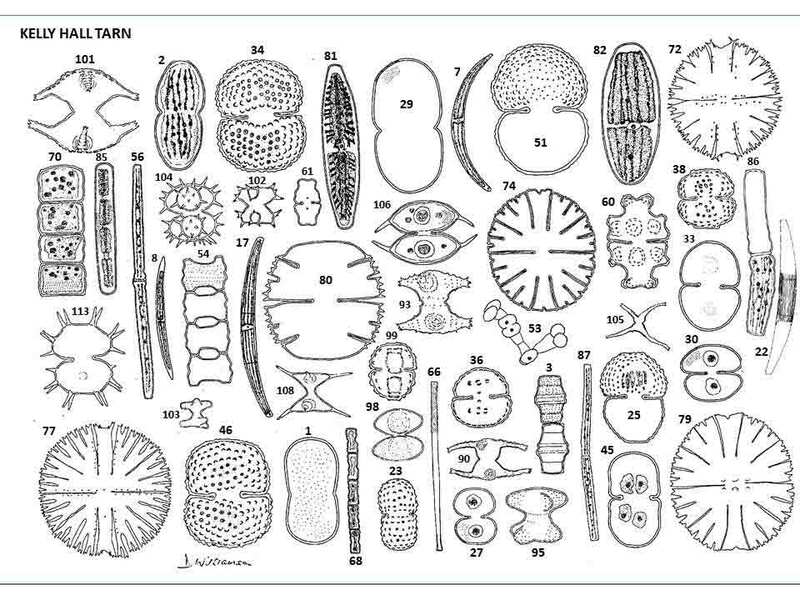 The presence of transitional forms in the diatom assemblage at Cregduff may be an artefact of our inability to differentiate biological species based on a limited range of morphological criteria on offer. However, it is also possible that we are looking at a situation where the Linnaean species are not reproductively isolated from one another, allowing hybridisation. The concept of a “hybrid swarm” is well known in some other groups (e.g. orchids) but has never been formally demonstrated in diatoms. However, the wide morphological diversity within a single genus in one sample alongo with, in some cases, apparent continua of variation, does raise questions about speciation within thi genus. The final twist to this story is that, from the point of view of current ecological status assessments, all this diversity has little effect. Though everyone grumbled about the difficulties in naming the Gomphonema species, the results, as the box-and-whisker plot in the previous post show – were less variable than in many of our other ring tests. What I suspect happened is that the underlying taxonomic confusion means that many of these taxa have “mid-range” scores for the TDI (and other indices), so the final calculation cancels out the identification issues. Bear in mind that this may not always be the case! * I understand that this is the correct name now, rather than Rorippa nasturtium-aquaticum. See Al-Shehbaz, A. & Price, R.A. (1998). Delimitation of the genus Nasturtium (Brassicaceae). Novon 8: 124-126. Abarca, N., Jahn, R., Zimmermann, J. & Enke, N. (2014). 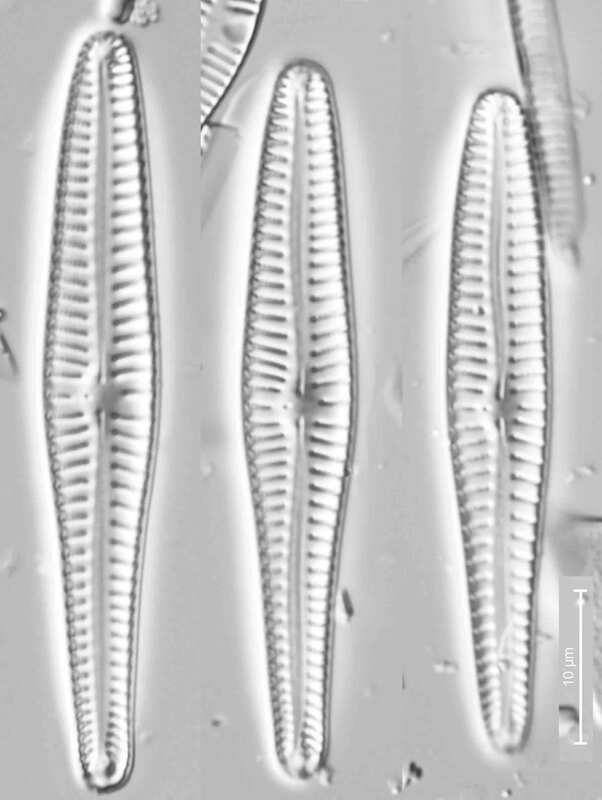 Does the cosmopolitan diatom Gomphonema parvulum (Kützing) Kützing have a biogeography? PLOS One 9: 1-18. Kermarrec, L., Bouchez, A., Rimet, F. & Humbert, J.-F. (2013). First evidence of the existence of semi-cryptic species and of a phylogeographic structure in the Gomphonema parvulum (Kützing) Kützing complex (Bacillariophyta). Protist 164: 686-705. Last week saw a small career achievement as I sent out the result of the 50th diatom ring-test that I organise for the diatom analysts in the UK and Ireland. “Ring-test” is the informal term for an inter-laboratory comparison, when two or more laboratories analyse the same sample and compare their results. We started out doing regular ring-tests in 2007 for all the people who were analysing diatom samples for assessments associated with the Water Framework Directive, sending out five slides each year to staff in the UK and Irish environment agencies and contractors who worked with them. Now, a decade later, the scheme is still going strong, with participants from Germany, Sweden and Estonia joining the British and Irish contingents. There are a number of similar schemes around Europe with the same basic model: the organiser sends out copies of a slide made from the same sample, all participants then analyse the slide and send in their results, which the organiser collates. There is usually one or more designated “expert” against whose results everyone else is judged. Most of the other schemes then organise a workshop at which participants gather to discuss the finer points of diatom taxonomy. We have had workshops in the past, but these are not directly linked to the ring-tests. Instead, we send out a report that summarises results and provides notes on the identification of difficult or unusual taxa. The money we save on workshops means that we can circulate more slides. I’m a great believer in “little and often” for this type of quality control. A second feature of our scheme (which some of the other European schemes have also now adopted) is to use a panel of experienced analysts to provide the benchmark that other participants should achieve. This means that we have an idea of both the average result and the scale of the variation associated with this. We learned early on that some samples gave much less variable results than others, even when the analyses were performed by experienced analysts. We use this knowledge to adjust the size of the “target” that participants must achieve. The graphs below show the results for our most recent test. The horizontal blue lines on the left hand graph show two standard deviations around the mean of the “expert” analyses (expressed as TDI). This is the “warning limit”; if an analyst exceeds this then he or she should be looking at their results to see if they have made any mistakes. The red line is the “action limit”, seven TDI units either side of the expert mean. 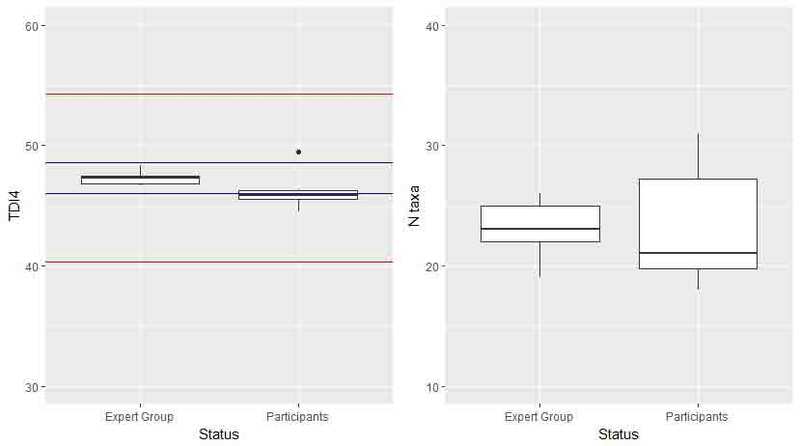 We know from other studies (see lower graph, left) that it is very unlikely that two replicate analyses have a greater difference than this, so analysts who exceed this should definitely be checking their results. The results of the 50th UK / Ireland diatom ring test showing (left) difference in TDI and (right) number of taxa (N taxa) between experts and other participants. Blue lines: mean TDI ± two standard deviations of expert panel’s mean; red lines: mean TDI ± 7. Note that it is unusual for the between-analyst variability to be quite as narrow as it was for this slide. The reason why we need flexible “warning limits” is illustrated in the right hand graph below. This shows the similarity between two counts as a function of the diversity of the samples. The relationship has a wedge-shape (illustrated by the blue line – the regression line through the 90th percentile of the data). There are a number of reasons why two analysts are unlikely to get identical results, one of which is that they disagree on the identities of the taxa that they encounter (the reason why we are doing the audits in the first place). But what a wedge-shaped relationship is also telling us is that there seems to be an upper limit to the similarity that can be achieved at any given diversity. This is an inherent stochastic quality of the data and has nothing to do with the competence of the analysts. Left: some of the data from which the “action limit” for the ring-tests was established. These are the results of audits of 67 samples from Northern Ireland in which the original (“primary”) analysis was checked against the result of an independent (“audit”) analysis. 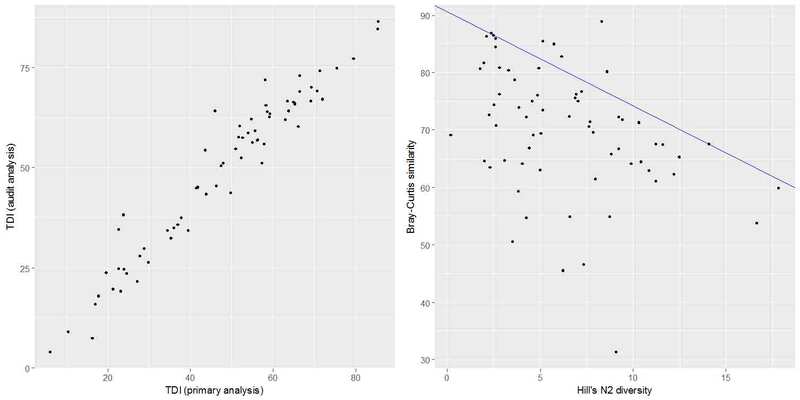 Right: The effect of diversity on the similarity between primary and audit analyses for the same dataset. A further way in which our scheme differs from others is that no-one “passes” or “fails”. That might seem counter-intuitive as this is supposed to be a test of competency. 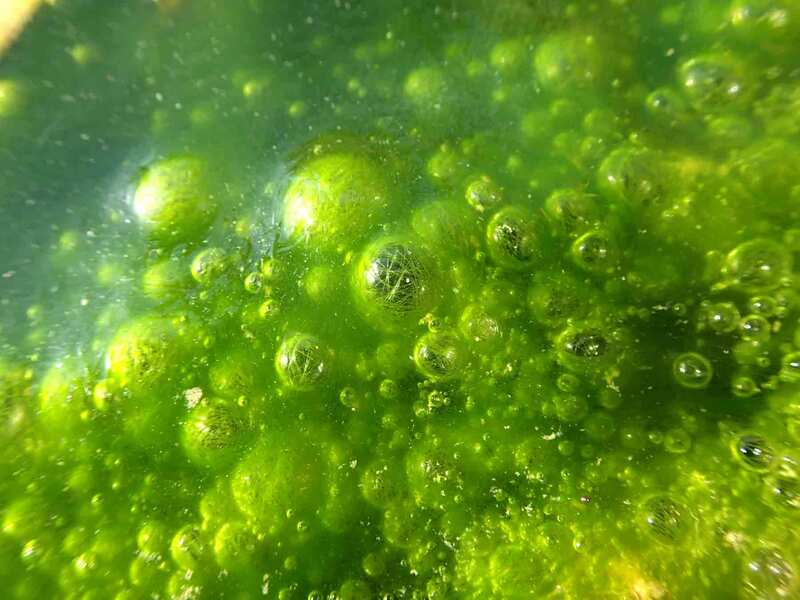 A regular reader of this blog, however, should understand that absolute truth is often elusive when it comes to identifying diatoms and other algae. The hard objectivity needed for a real test of competency always has to be moderated by the recognition of the limitations of our craft. Moreover, turning this exercise into a calibration exercise runs the risk of turning the analysts into machines. Rather, we use the term “reflective learning”, encouraging participants to use the reports to judge their own performance relative to the experts, and to take their own corrective action. Some of the organisations whose analysts participate use the ring-test as part of their own quality control systems, and will take corrective action if results stray across the action limit. That seems to be a sensible compromise: quality control should be the responsibility of individual laboratories, rather than delegated out to third parties. At the same time, organisations need to understand that the people who perform ecological analyses are professionals, not treated as if they are one more machine in a laboratory that needs to be calibrated. If you are interested in joining the UK / Diatom ring test scheme, or just want to learn a little more about it, get in touch with me and I’ll do my best to answer your questions. Kelly, M.G. (2013). 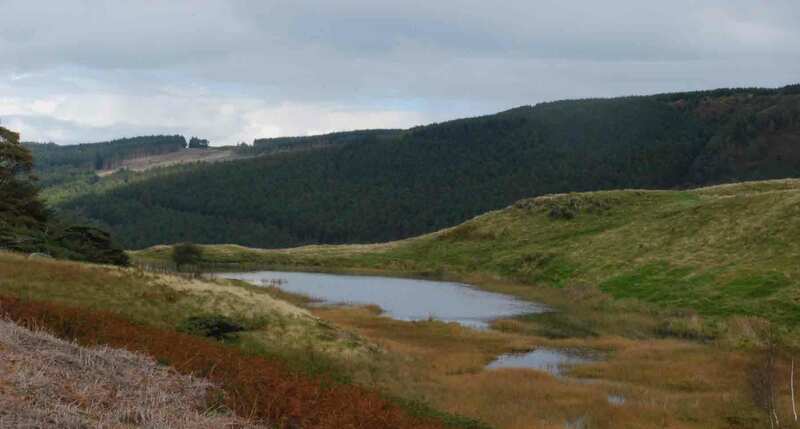 Building capacity for ecological assessment using diatoms in UK rivers. Journal of Ecology and the Environment 36: 89-94. Back in 1995 I interviewed a number of eminent people about their first academic publications as part of an occasional series for the Times Higher Education Supplement. I wrote about one of the more daunting of these in “An encounter with Enoch Powell”. The hour or so I spent with Sir Roger Bannister, who died a couple of days ago, could not have been more different. He was best known for three minutes 59.4 seconds on a running track in Oxford in May 1954 but went on to have a successful career as a neurologist and eventually became master of Pembroke College, Oxford. He was, despite this sporting and academic prowess, one of the most charming people I have met. One of the secrets of his success on the running track was that he was, to all intents and purposes, a sports scientist before that term had been coined. He took time out from his medical degree to do research on the physiology of breathing and, more particularly, how the point of exhaustion could be delayed by feeding his subjects with different concentrations of oxygen. As a medical student working in straightened times just after the war, his first task was to build his own equipment, including the treadmill on which he and an assortment of colleagues and friends ran in order to generate the data he needed. Building this kit involved trips to RAF bases to strip meters and other parts from decommissioned bombers (John Hapgood, former Archbishop of York and also a physiologist by training told me a very similar story). Whilst his experiments were not directly relevant to his running (his actual training time amounted to less than an hour a day), there was, clearly, a benefit from understanding how his body worked. However, whilst a runner cannot alter the concentration of oxygen that he breathes, a mountaineer can, and Bannister’s work was used by the team that conquered Everest the following year (he commented that he was surprised at how unfit some of the Everest team were by the standards of track runners). Whatever his other achievements, however, it was that afternoon in Oxford in May 1954 that defined Roger Bannister. Three minutes 59 seconds works out at just over a quarter of Andy Warhol’s quotient of fifteen minutes of fame and would have ensured Bannister’s place in the history books. However, as the obituaries in the newspapers show, he achieved far more than that in his life. And he was a gentleman too. If you have the patience to battle with News International’s paywall, you can read my original article by following this link.